Innovation is typically seen as a cumulative process, with new technologies building on existing knowledge - but our knowledge of how progress in a specific area is influenced by knowledge in other, ‘upstream’ areas is limited. Using US patent data, this column identifies a stable ‘innovation network’ that serves as a conduit for cumulative knowledge development. Technological advances in one field can advance progress in multiple neighbouring fields, but will have a stronger influence on more closely related areas. Technological and scientific progress is typically depicted as a cumulative process with new innovation building upon existing stocks of knowledge (Romer 1990, Aghion and Howitt 1992), and existing literature provides evidence supporting this theory of ‘standing on the shoulders of giants’. Recent prominent empirical examples include Furman and Stern (2012), Bloom et al. (2013), Williams (2013) and Glasso and Schankerman (2014). These findings are an important building block for effective policy to support and enable innovation and economic productivity. Despite this progress, our understanding of how progress in a specific area is influenced by prior knowledge in other, ‘upstream’ areas is limited. Previous work has tended to depict the inputs to innovation in a given field as being either restricted to the prior knowledge in that field, or as an aggregate stock of ideas spanning all fields. In a recent paper, we show that instead there is a stable ‘innovation network’ that serves as a conduit for this cumulative knowledge development process, in which knowledge spillovers are neither completely local nor universal (Acemoglu et. al 2016). Instead, technological advances in one field can advance progress in multiple neighbouring fields, but will have stronger influence on more closely-related areas. The standard model of endogenous growth and technological progress depicts the flow of new ideas in a given field as a function of the existing stock of ideas in that field and the amount of resources allocated to producing new ideas. We extend this framework to measure dependence on the existing knowledge stocks in other technological fields, as well, through an innovation network. We represent this innovation network in a flexible form where each technology field can potentially derive inputs from other technological areas. This can include cases where knowledge broadly spills over onto other fields and cases where the cumulative process is confined to a narrow field. We further allow for knowledge diffusion processes that adjust with the age of invention. We apply this framework to the US Patent and Trademark Office (USPTO) database, which documents technology classifications for each US invention, and citations to the prior patents on which the current work builds. We use the set of patents granted between 1975 and 1994 to construct the innovation network matrix. Figure 1 shows an example of the innovation network matrix constructed from patents from 1975-1984 and the citations they receive within their first ten years. This figure highlights the heterogeneity in technology flows – for example, patents in ‘Computers: Peripherals’ tend to pull more from ‘Computers: Communications’ than the reverse, while ‘Computers: Communications’ builds more on electrical and electronic subcategories. This network is quite stable across different time periods. We test the potency of the innovation network but interacting this network structure, held constant at these initial levels, with future patenting by technology field to see how well we can predict future ‘downstream’ innovation. 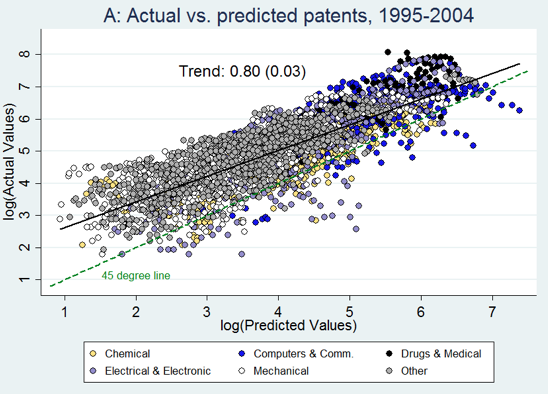 We find a quite strong relationship between the predicted and actual values of future patenting – a 10% increase in expected patenting is associated with an 8-9% increase in actual patenting, with the exact elasticity depending upon whether we include own-field spillovers or work with an external network only (the latter having clearer identification of effects). 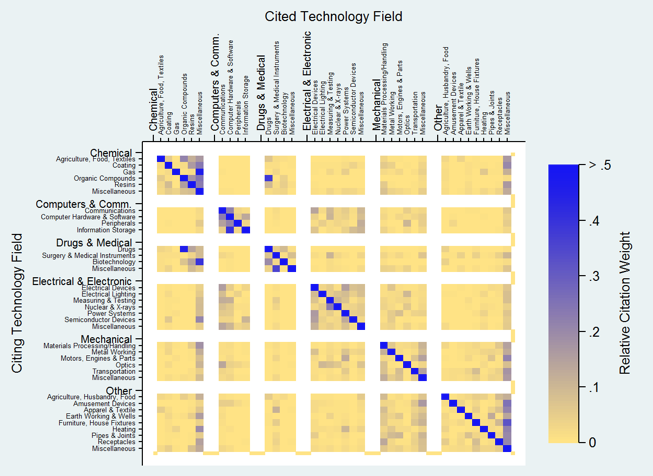 Figure 2 shows a visual representation of this effect using 484 USPTO patent classes, color-coded by parent technological category. Additional tests confirm this relationship holds in panel estimation formats and in a battery of robustness checks. For example, we document that the knowledge flow is asymmetric, with innovation in upstream technologies predicting future downstream patenting, but not the reverse. Other interesting extensions document the extent of knowledge spillovers in the technology space. Whereas models sometimes take polar cases like a common knowledge stock for all technologies or fields building only upon their own work, the truth lies in-between – technologies tend to build upon a few upstream classes that provide innovation stimulants. We find a robust connection of innovation to the ten most important upstream patent classes, which diminishes afterwards. This network heterogeneity indicates that knowledge development is neither global, in the sense that fields collectively share an aggregate pool of knowledge, nor local, in the sense that each field builds only upon itself. Overall, our research finds that upstream technological developments play an important and measurable role in the future pace and direction of patenting, with an advance in one field providing a basis for further innovation in related areas. We find evidence of a stable innovation network with strong predictive power for future patenting. A better accounting for this innovation network and its asymmetric flows will help us model the cumulative process of scientific discovery in a sharper manner. An interesting path for future research is to consider whether large leaps behave in the same way as the advances studied here. We also believe that this approach can be pushed to consider regional and firm-level variation, which can further help us understand the causal impact of patenting on economic and business outcomes. Acemoglu, A, U Akcigit and W Kerr (2016) “Innovation network”, Proceedings of the National Academy of Sciences, 113(4). Aghion, P and P Howitt (1992) “A model of growth through creative destruction”, Econometrica, 60(2): 323--351. Bloom, N, M Schankerman and J Van Reenen (2013) “Identifying technology spillovers and product market rivalry”, Econometrica, 81(4): 1347--1393. Glasso, A and M Schankerman (2014) “Patents and cumulative innovation: Causal evidence from the courts”, NBER Working Paper No 20269. Furman, J and S Stern (2011) “Climbing atop the shoulders of giants: The impact of institutions on cumulative research”, American Economic Review, 101(5): 1933--1963. Romer, P (1990) “Endogenous technological change”, Journal of Political Economy, 98(5): 1002—1037. Williams, H (2013) “Intellectual property rights and innovation: Evidence from the human genome”, Journal of Political Economy, 121(1): 1–27.